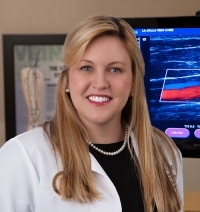 » Watch Next Video by Nisha Bunke-Paquette, MD - What are minimally invasive vein treatment procedures? How are varicose veins diagnosed? That's a good question. Varicose veins are diagnosed by combination of a clinical examination by your doctor as well as a venous duplex ultrasound examination. Most of the time, varicose veins have an underlying source that is not visible to the naked eye. So the ultrasound examination allows us to see the veins that are beneath the surface of the skin. We are able to identify the valve function, the direction of blood flow, and we can even see the deep veins which are located within the muscle.